Back in July I mentioned my plan to set a car fund here. I was to choose between that and buying a car through the traditional high interest car loan. The thought has never left my head since. The most tricky part was on the choice of saving/ investment tool. It was either the money market, similar to the Just Invest account that I use for the emergency fund, or stocks through an index fund. I then went ahead to compare the Mr's index funds using the spreadsheet (I love excel). Remember how I go on and on about the Dividends as a great form of passive income. So Satrix DIVI was an obvious winner. It has done well in the past year. 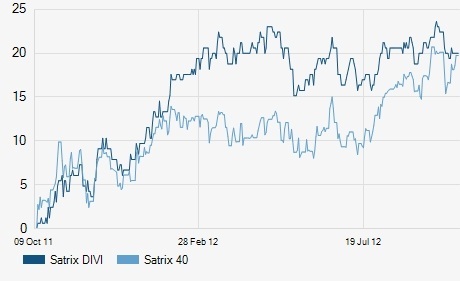 Its done well both on capital growth and dividend pay out compared to Satrix 40. That's all I compared. See the comparison above. Its not as dramatic in a 3 year graph. But, like I mentioned, the high dividend payout is my main motivation. I will stick with the DIVI for the car fund. Its the R5000 per month until I cant take the car shopping abstinence anymore. I hope I can hold on for 5 years. If I don't, its no big deal, I guess. Just saying. Whats not to like. I went ahead to check the individual shares in those categories. I liked them. And the 20% growth for the past year also helps. I will report on this monthly as well. Hope its a fun and profitable 5 year ride. Browse the individual shares in the basket below.